Sure, you wouldn’t put “winterize your deck” at the top of your most-desirable chores list. (Also, does anyone have a “most desirable chores” list? Because we need some of that can-do attitude.) This doesn’t mean, however, that winterization isn’t extremely important. If you want your decking to last all winter long, it’s critical you make a plan to keep it safe through rain, sleet and snow. Here are a few crucial thoughts for protecting that deck … and your investment. Sweep the deck off thoroughly. If anything sticks to the deck (like a sappy branch), gently pull it up by hand rather than grinding at it with the broom or another tool. This is very important, as leaving leaves or branches underneath a layer of snow can risk staining any deck surface, even normally stain-proof aluminum. Spray off your deck, getting remaining grime off of the surface. This is a good reason to winterize in fall before cold weather sets in and you risk creating ice. Wash the deck with a light bleach-free cleaner, then rinse. Wait for the deck to dry completely before taking any further steps. These are good steps to take the rest of the year as well. Any time you see debris building up, take an hour to get everything you can off the surface. The next steps depend on the surface of the deck. Unlike wood, aluminum does not need to be sealed to protect it from the elements, nor do other types of decking. For years, wood was the gold-standard of decking material, so many popular conceptions about winterization stem from it. It’s true that wood does need sealing over the winter, so you should use a stain or waterproofing substance. Many types of decking material don’t need sealing, however, which makes them much more accessible to homeowners that don’t have time or interest in upkeep. Aluminum is one of the best options, for instance. After you complete the above cleaning steps, you’re done. We do not recommend using salt or any ice melting chemicals to clear ice and snow off of aluminum decking. They can corrode the aluminum and damage the decking surface. Letting a lot of debris build up can also cause trouble in the form of oxidation, a while film over the top. Luckily, you can take care of that with a simple vinegar wash most of the time. If not, call a decking expert. Also, we recommend using a plastic snow shovel. A metal shovel could more easily damage the painted surface. Need Expert Help with Your Deck? 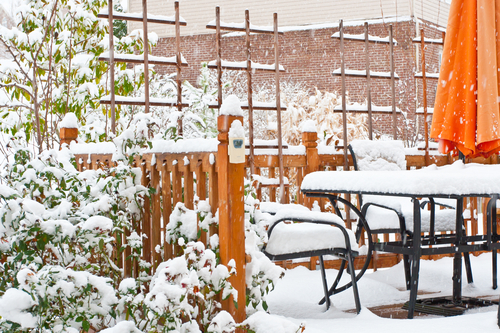 Now that you have a basic to-do list for how to winterize your deck, it’s time to get going. Or, if you’ve simply read this to educate yourself on the best types of decking material, it’s time to pick up the phone and call the decking experts at Wahoo Decks to get that new outdoor living space installed. Call 678.343.2317 or connect with us online now.